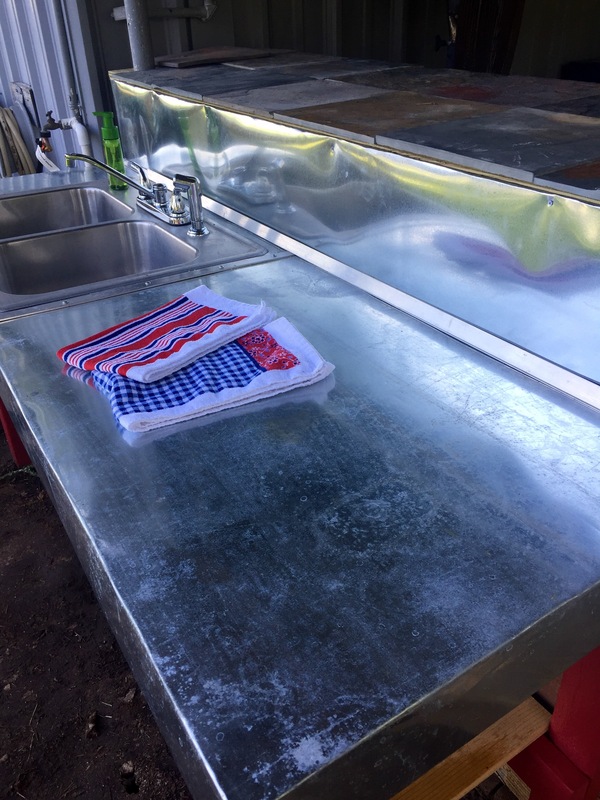 If you check in with me on Facebook, then you know we have been working on an outdoor kitchen in preparation for our full-time indoor kitchen to be out of commission. Mr. Math has worked hard on the kitchen but with teaching summer school and my new and much more demanding job, it was a slow start. Just about the time we were making progress, sub tropical Cindy rolled through and the tropical moisture has hung around. We are getting rain daily. Our yard is beautiful, especially for end of June, but painting and carpentry outside has been a challenge. 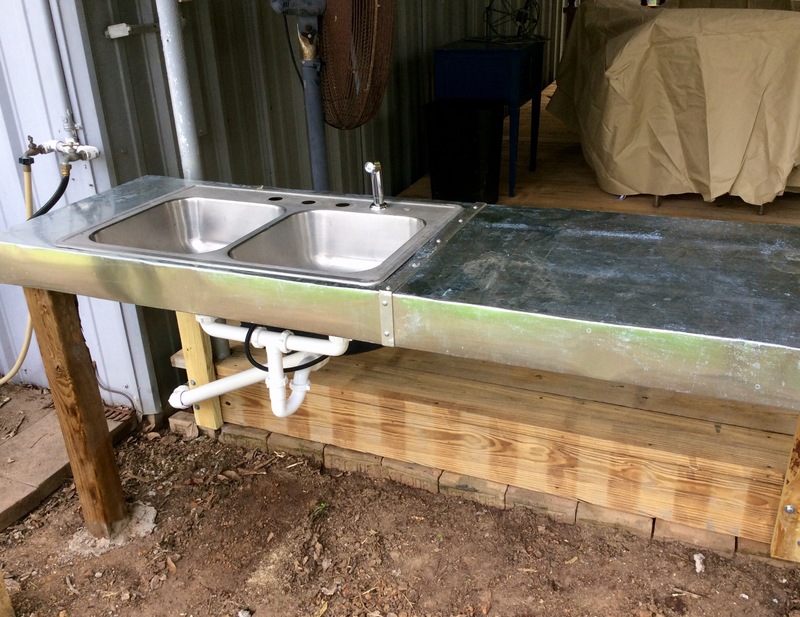 I am happy to report we now have running water, a sink that drains properly, a galvanized metal counter and a storage cabinet that has sealed rusty metal as inserts n our outdoor kitchen. A glorious sink outside. This will be a place for the dudes to clean up when they are working on machines, cleaning fish, and smoking meat. Yay for me! 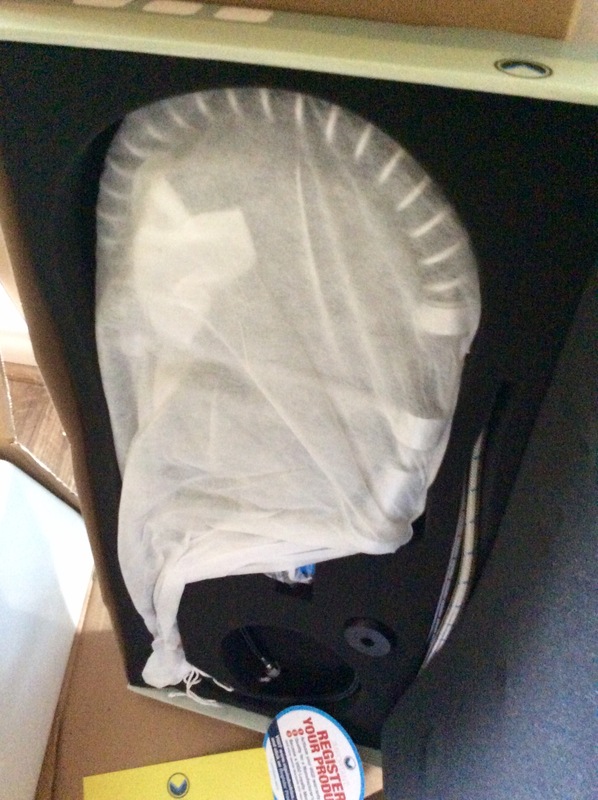 No more nasty stuff coming inside. The counter top will look weathered with time and when I am happy with the finish it will be sealed. The backsplash is the same material. I am not sure it is finished. I think it may need more screws to smooth it down. We are grandparents now and it is funny the things that worry us that we might not have worried about before. Like sharp corners. They are all covered with corner piece. 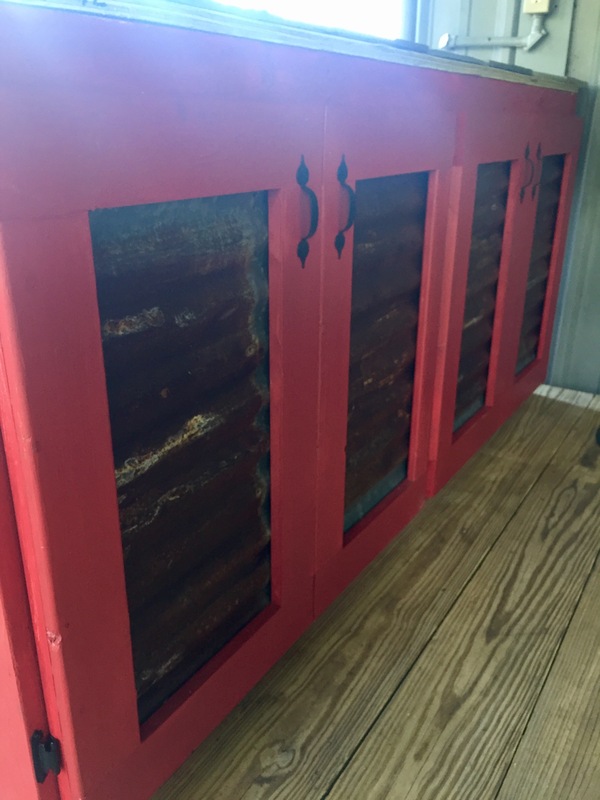 The cabinets are painted with Behr Circus which is a soft, rusty, red. 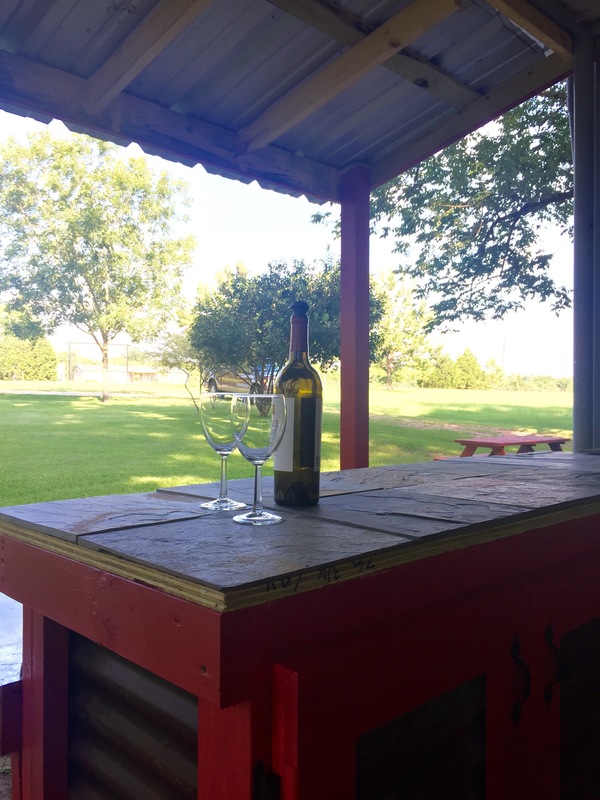 It blends well with the redwood stained picnic table. 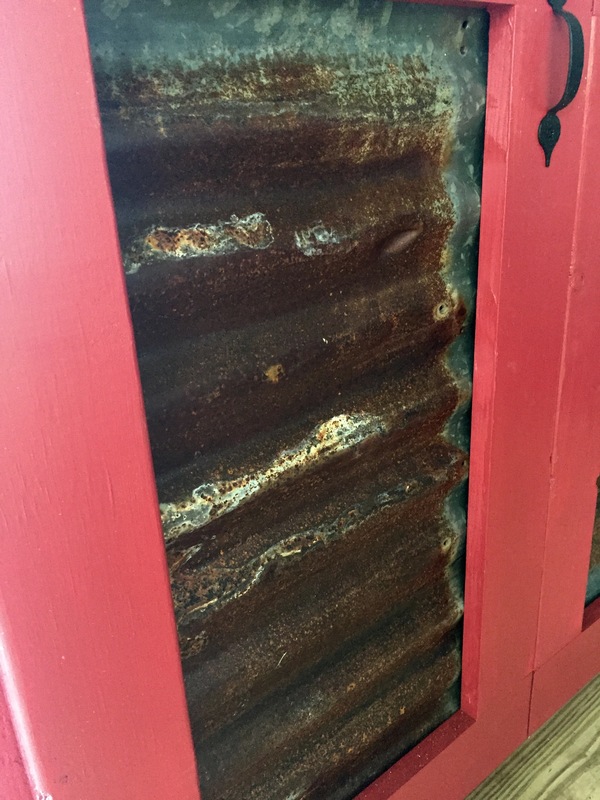 I love those corrugated tin inserts. The tin is from Mr. Math’s family farm. It is at least 60 years old, but my guess is it is older. It all got coated with polyurethane before being installed to seal it. Here is what is finished. We couldn’t finish the shelf underneath because we ran out of 1X6 boards but it will be quick work. I am going to stain and seal the boards. I am thinking that the drain needs to painted either silver or black. The porch will be great once we are through but right now it is a mess. The slate top is not done and the trim work needs to be finished around it but it is going to look great. Stone sealer will keep out the yuck. This is going to be a great spot to hang out, entertain friends, and cook. I am looking forward to getting this one finished. Thanks for following along on our journey. It was another busy weekend here at Providence Acres. We had family over, we made a trip to see my sweet daddy for Father’s Day, we picked a pile of peas, tomatoes, squash, peppers, and kale. I now have a freezer full of produce for later. We also made progress on the outdoor kitchen. This is a low budget, heavy use project so, we were way more concerned with functionality than aesthetics. 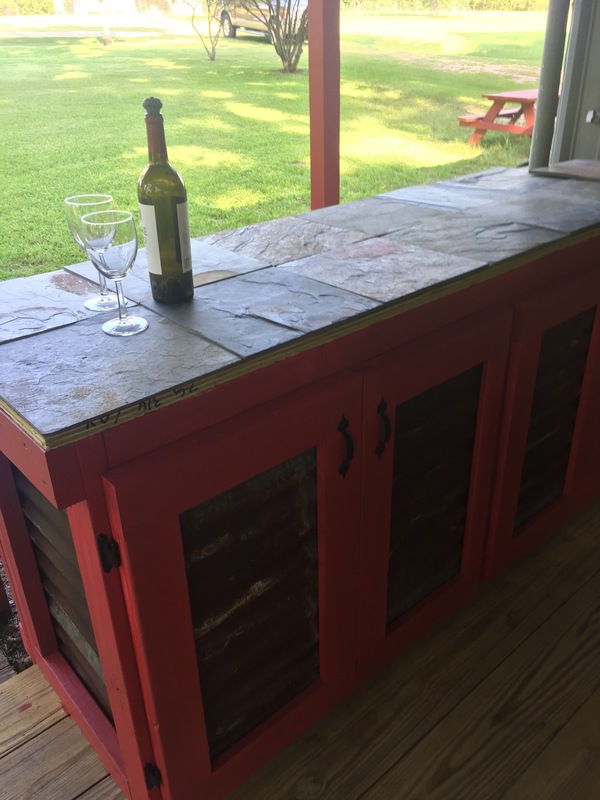 It will be stained barn red and will look better, but honestly not having the dudes run in the house to use my sink to clean fish, wash nasty hands, or drip meat juices makes my heart sing. The timing of this project is crucial because my inside kitchen is about to be under renovation and I will never wash dishes in the bathtub again. Two homes we lived in required me to do dishes on my knees at some point and I am over that. Forever. Mr. 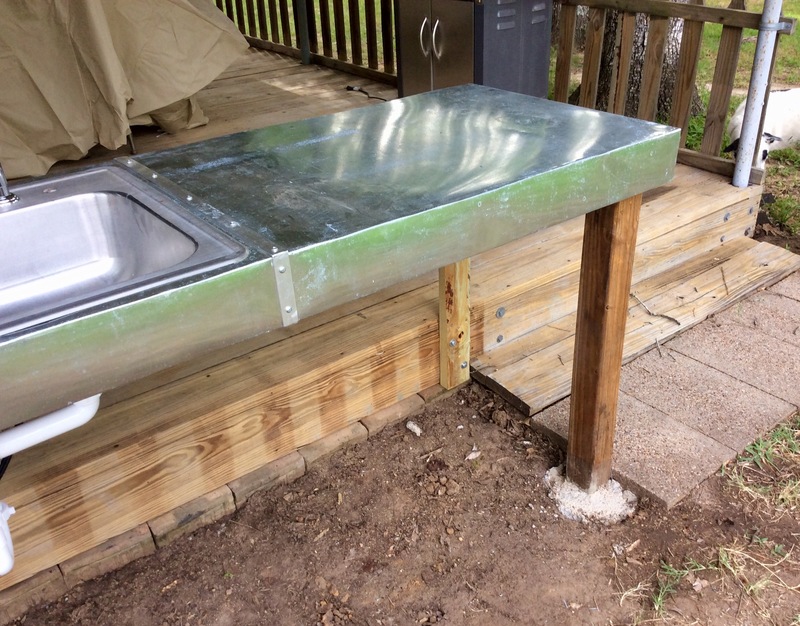 Math built the sink base out of treated 3/4 inch plywood and 4X4 posts. 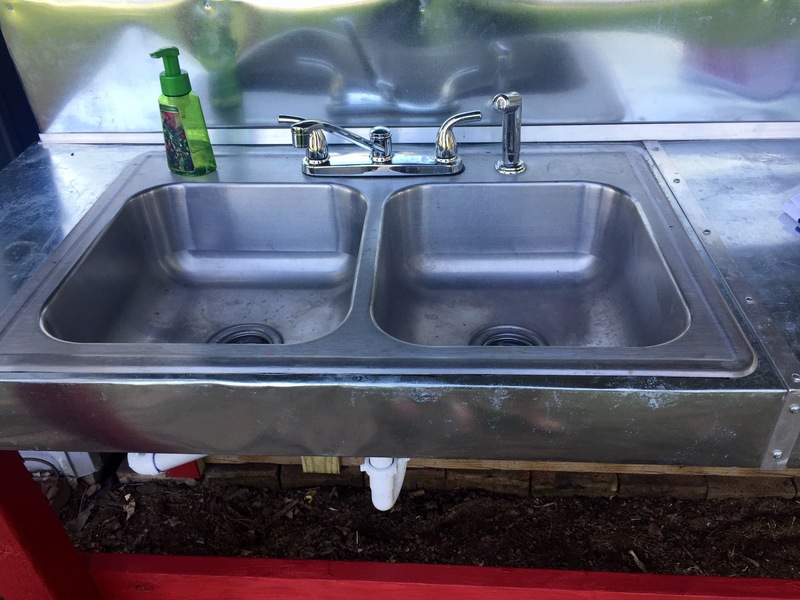 The stainless double sink was a side of the road find. We bought the cheapest faucet they had at Home Depot that had a spray attachment. It took us over an hour in HD to puzzle out the plumbing but the sink now drains 55 feet away so the fish water won’t be gross smelling when we are sitting on the deck. The counters are this sheet metal. 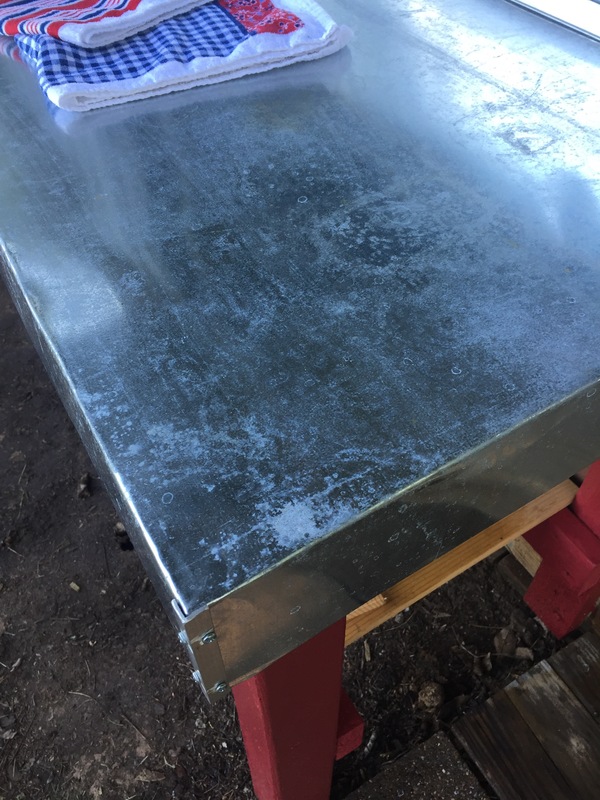 It took two sheets to clad the counter. 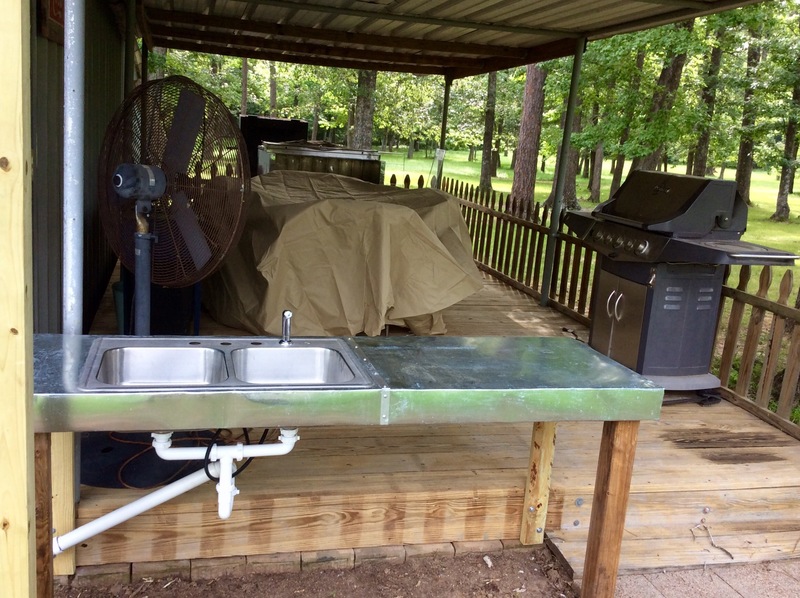 So far, we have the metal roof extension, counter clad in metal, deck power washed, drain in, and plumbing for water worked out. We didn’t get the right water connection but it should go quickly. Next will be to add cabinets up on the deck that will back up to the sink and will be backed and topped in metal. We are also going to be adding a very small hot water heater. 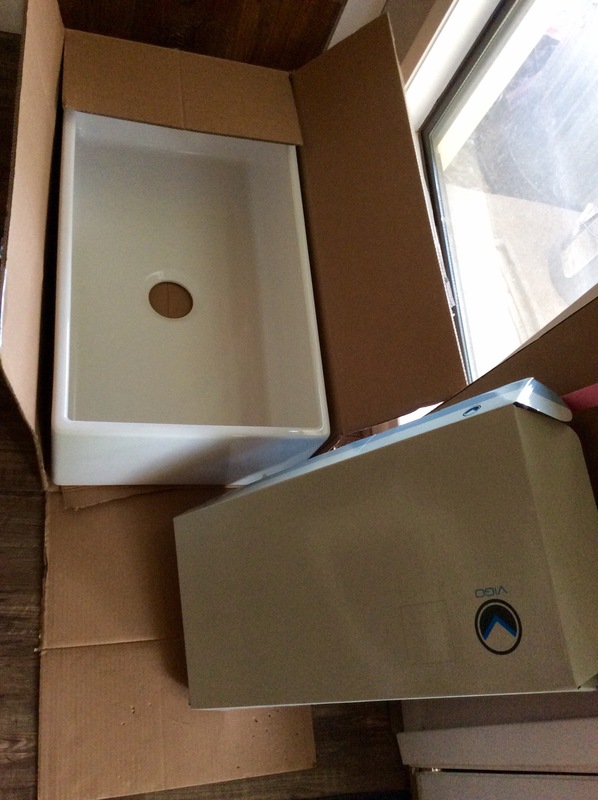 I am so excited that my farmhouse sink and faucet arrived from Overstock safe and sound. The quartz has been selected. 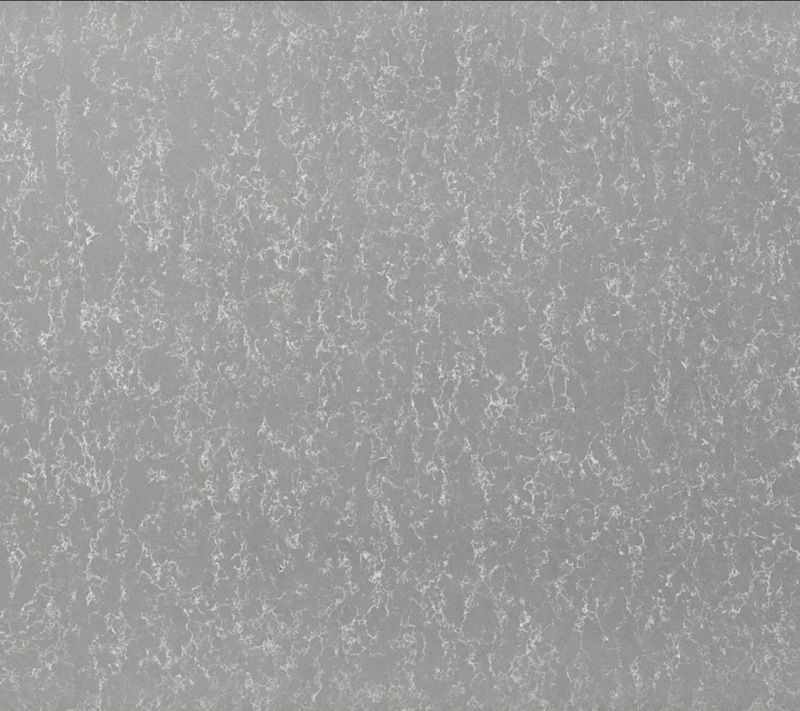 Zodiaq concrete. 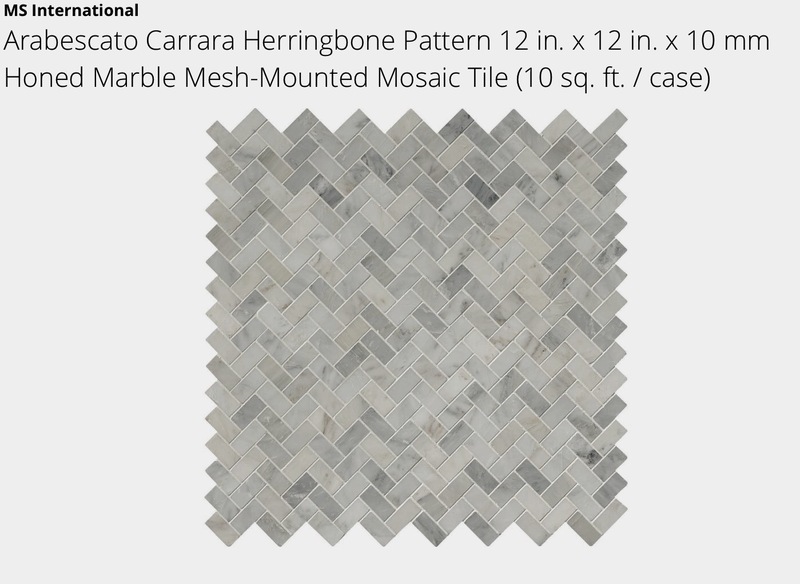 The backsplash will be this awesome herringbone marble. Mr. Math is going to redo the cabinets so that they look like white shaker style. Next week I will be so super busy that I will be out of commission but soon I hope to have pictures of a finished outdoor kitchen all staged and looking nice. I promise I haven’t fallen off the face of the earth. Really, I am still alive and kicking. Right after I wrote to you that I missed you and was back, there was another turn in my road. I was offered the opportunity to be Director of Elementary Instruction for the fast growing district I have worked for the past four years. Crazy. It has taken all my extra minutes just to catch up. You see, for the past 10 years my focus has been secondary and or advanced students. I have had terms to learn, programs to get up to speed on, research to read, and plans to make. I am excited for this opportunity and expect this to be my last stop in public education before retiring, but I would have said that about my last position too, so what do I know. 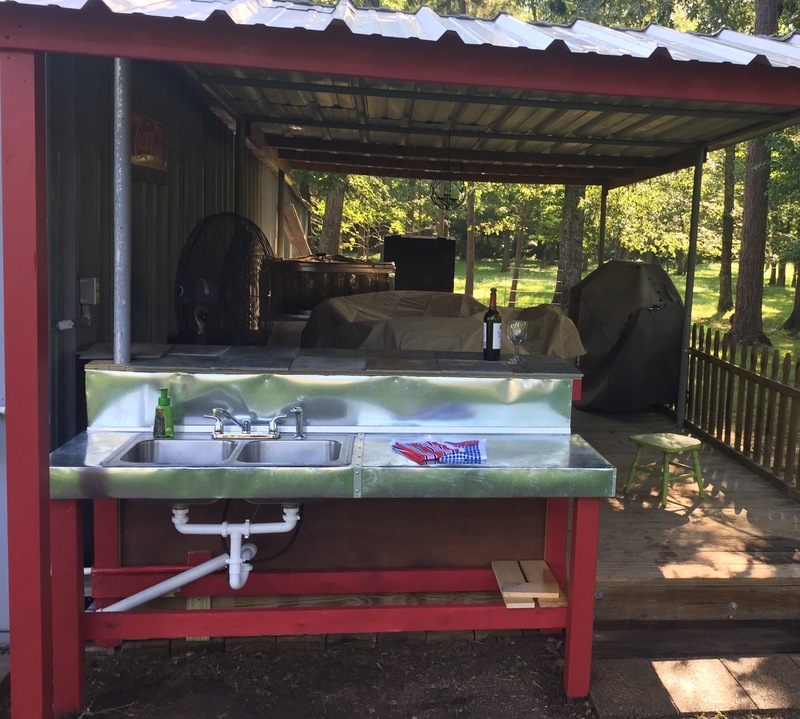 In the next week, I will have a few posts that include our outdoor kitchen (which had to be finished first), the kitchen renovation that is imminent, and what is up at our little cabin in the woods. I spent a few moments this evening looking longingly at my shop. I must make time to get back to what feeds my creative side.